An October Pew Research Center report examined Americans’ views about automation, including their opinions on how widespread these technologies would become over the next 20 years. Here’s what Americans expect to happen when it comes to four specific types of automation. As medical records migrate online, algorithms may become more integrated into patient care. Some hospitals are already using computers to help diagnose certain diseases or update physicians about a patient’s condition. While there have been some notable challenges in using this type of technology in medicine, most Americans predict it to be the norm in the coming decades. 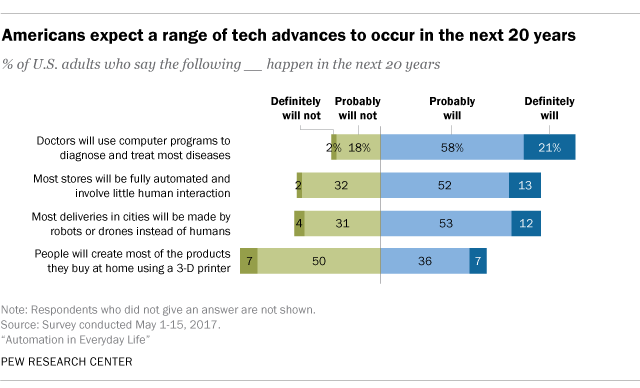 Roughly eight-in-ten U.S. adults (79%) say that in the next 20 years doctors will use computer programs to diagnose and treat most diseases, including 21% who say this will definitely happen. Some companies are ushering in new types of consumer experience, from grocery stores with no cashiers to restaurants that use robots instead of chefs. But some critics are concerned that fully automated stores could leave retail and fast food workers without a job. The Center’s survey finds that roughly two-thirds of Americans expect that in the next 20 years most stores will probably (52%) or definitely (13%) be fully automated and involve little interaction between customers and employees. Around two-thirds of U.S. adults (65%) say it’s probable that most deliveries in major cities will be made by robots or drones rather than humans in the next two decades, including about one-in-ten (12%) who say this will definitely happen. In Washington, D.C., companies are already using robots to deliver meals to customers’ doorsteps. And the federal Department of Transportation recently launched a program that allows states to experiment with drone deliveries. This technology, however, isn’t without its critics. Citing potential safety problems, San Francisco lawmakers are considering banning delivery robots on sidewalks, and some members of Congress have raised concerns about privacy issues related to drone deliveries. Americans think it’s less plausible that people will be creating most of the products they buy via a 3-D printer at home. Roughly four-in-ten Americans (43%) anticipate this in the next 20 years, but a majority of U.S. adults (57%) say this probably or definitely will not be commonplace. While 3-D printing has been around for decades, its commercial use is relatively new. Today, 3-D printers are being used to create products ranging from prosthetic legs to jewelry and even chocolate. As this type of technology has become more accessible to consumers, questions about possible copyright infringement and intellectual property violations have also surfaced.